After she obtained a bachelor’s degree in communication from UC San Diego and a master's in organizational management from the University of Phoenix, curiosity led her to a career in law enforcement. The constant challenge and a desire to help people captured her attention and she later graduated from the FBI National Academy. Luhnow was sworn in as Santa Barbara’s top cop Monday, after 27 years with the San Diego Police Department. She says the first order of business is to strengthen communication engagement, work collaboratively with social agencies and build trust with locals and her employees. During her time in San Diego, Luhnow oversaw the department’s investigations, special operations, patrol and traffic divisions, as well as recruitment and training. Concord Police Chief Guy Swanger, who previously served 25 years with SDPD, said Luhnow is a problem solver. He chose her to serve on the Domestic Violence Response team, where she managed hundreds of investigations and domestic violence calls. In 1993, he said, Luhnow was the first female motor officer in San Diego. 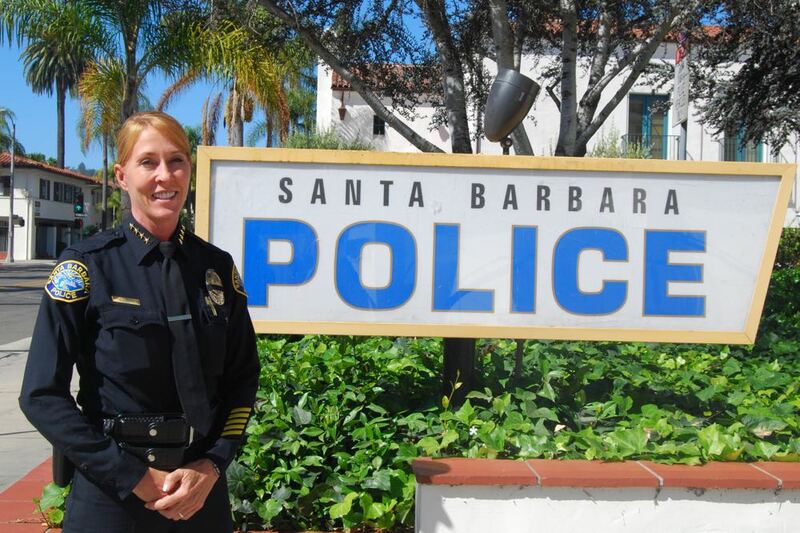 Luhnow, Santa Barbara’s first woman police chief, said it’s important to build relationships with officers and residents. With the challenges police are facing at a national level, the 50-year-old said the time to build community trust has never been more important than it is now. “The successes I’ve had in my career have been because of the contributions in the community,” she said. Luhnow said working in San Diego’s historic Gaslamp Quarter brought a range of challenges that should help her here. Luhnow said she wants to work promptly, and provide client-specific services for the homeless. She says her strategy is to build connections with social service agencies and community partners that can bring resources to individual situations. Luhnow wants the department to be seen as determined to make a positive influence on youth. In addition, Luhnow says she would like to bring back beat coordinators, strengthen the department’s social media presence and establish partnerships with nonprofit organizations. Luhnow is meeting with community leaders and making local connections. “I have the desire to do what it takes to strengthen relationships and ties,” she said. After a lengthy national search for a candidate to succeed Police Chief Cam Sanchez, who retired in February after 15 years in the position, Luhnow was selected from among 91 qualified applicants. City Administrator Paul Casey made the final choice. “She possesses the broad mix of experience and personal qualities that I was looking for in a police chief,” he said. “But she also has personal qualities that will serve her well in Santa Barbara — enthusiasm, professionalism and commitment to community. Luhnow plans to lead and keep her staff of 212 sworn and civilian employees safe. She said the department has welcomed her with open arms. The San Juan Capistrano native said Santa Barbara feels similar to her hometown. The beach, arts, lively culture and landscape caught her attention. “Santa Barbara is a beautiful community that has the diversity of San Diego, but the smaller town appeal is truly me,” she said. After a weekend visit to Santa Barbara, Luhnow said she knew the city was a good fit. — Noozhawk staff writer Brooke Holland can be reached at bholland@noozhawk.com .